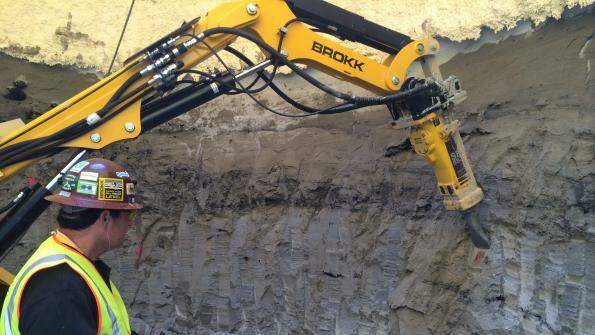 A remote-controlled Brokk 400 machine is helping to reduce combined sewer overflows, improve water quality in local rivers and support flood protection in Washington, D.C.
Two low-lying neighborhoods in Washington, D.C. were constantly battling flooding, with sewage spilling into the streets and vehicles becoming mired and submerged. Now, after nearly a century of dealing with these issues, the neighborhoods of Bloomingdale and LeDroit Park can see the proverbial light at the end of the tunnel. To solve the problems, construction began on the First Street Tunnel, a $157 million initiative, in late 2013. The effort is part of the DC Water Clean River Project, and is managed by The District of Columbia Water and Sewer Authority (DC Water). The goal is to reduce combined sewer overflows, improve water quality in local rivers and support flood protection. In October 2013, Skanska USA won the First Street Tunnel design-build contract as a joint venture with JayDee Contractors. "The project required compact, versatile equipment to enable us to construct the shafts efficiently and safely," says Scott Hoffman, First Street Tunnel project manager for Skanska-JayDee. The firm scheduled a demonstration of an 11,000-pound, remote-controlled Brokk 400, which can excavate a 26.5-foot-diameter shaft at twice the production rate of a conventional excavator, according to the manufacturer. Impressed with its performance, Skanska-JayDee has continued to use the machine for the duration of the project. Skanska crews continued digging the 2,700-foot tunnel with four diversion chambers, drop shafts and pumping stations to discharge the stored water to the Blue Plains Wastewater Treatment Plant. For the excavation, Skanska deployed a frozen ground system with three chiller units—a method to avoid the removal of ground water. This system super-cools the water in the soil by circulating chilled liquid brine through small pipes. With the system in place, Skanska used the machine to chisel away the frozen ground in a fraction of the time of alternative methods, according to the manufacturer. In less than three months, Skanska-JayDee completed the shaft-digging phase of the project, from ground freezing to excavation. DC Water officials estimate construction of the First Street Tunnel to largely finish in July 2016, with final completion set for September 2016. Click here to learn more about Brokk. Is there a resource where all the measurements are mentioned?